Belfast can boast an asset many cities can only admire with envy: a thriving traditional bar scene. Thanks to Belfast only beginning to grow rapidly in size in recent years, you can still find a large number of bars with an authentic and timeless feel. Let’s take a closer look at a few of our favourites. Cheers! The John Hewitt: The Ultimate All-Rounder? It might be ‘only’ two decades old (well, a little under 20 years) but many consider the John Hewitt to be a great example of a beautifully-executed classic Belfast bar. Why? Because it does so many essential things so well: a timeless interior, choice of locally-produced beers and spirits, live music and a lively atmosphere. Uniquely, the bar is owned by the Belfast Unemployed Resource Centre and named after poet John Hewitt. For a quirky option, take the ‘Jaffa Fountain’ (you can’t miss it) exit out of Victoria Square shopping centre to discover Bittles Bar. You’ll discover why Bittles is fampus for its ‘flat iron’ shape, great whiskey collection, local character and local art. With a history dating back to the 1860s, you’ll also uncover a real sense of old Belfast too. An obvious choice, yes, but for good reason. 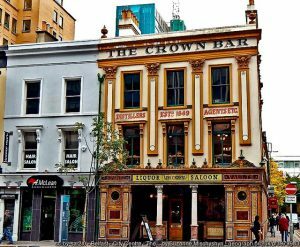 The Crown (Great Victoria Street) is of such historic importance to Belfast that it is a protected building and owned by the National Trust conservation charity. You’ll find stunning ‘booth’ seating areas to relax in – if you get there early! – in this 1880s Victorian gin palace. Hearty food is served, including in an upstairs restaurant, while cask and craft ales are available for beer enthusiasts. Proudly welcoming drinkers in timeless style since 1870, the Garrick’s tiling and woodwork interior is a mini-museum in its own right. It takes the length of an entire rear wall to include the huge choice of drinks available in this understated and cosy bar. Food is available and a second ‘back bar’ can be found at the rear of the building. A Belfast institution!